I got this funky footed bowl with a lid at my local Goodwill. I really like the bowl, but wasn’t too wild about the lid. I think it might have been the wacky curly-doodad on top. It was sort of antennae-ish to me. An idea started formulating in my mind… I had a little glass vase/jar from an old reed-diffuser and decided it would be a nice base for a footed bowl. I figured some plastic beads from the Dollar Tree would be just the right thing to add some detail. Since I knew that I would be painting this entire thing with a coat of Heirloom White it didn’t matter to me that the beads were purple, plastic and of the Mardi Gras variety. I flipped the lid (henceforth, the “bowl”) upside down. I ran a little bit of glue around the edge. To “start” the beads I put a little dollop of hot glue to hold the strand securely. By having the strand rest along the counter top I had hoped it would provide a guide and that the beads would go on straight. While the glue on the bowl was setting, I took more beads and glued them on to the neck of the little glass bottle. Next I glued the bowl to the bottle to create a pedestal bowl. I began to add a second row of beads only to discover that the first one hadn’t actually been all that straight. Oh well. It was already kind of craptastic, now it was even more of a challenge to make it something pretty. I loves me a good challenge. I spray painted the whole thing with my beloved Heirloom White…. It definitely needed something. Not just to pretty it up a bit, but also to help balance out some of the wonky parts…..
Beads. This was kind of a pain in the arse because each one was placed by hand, with tweezers. However, if you do this at the dining room table, where you would be sitting and supervising homework anyway, it isn’t so bad. I had filled the little hole that was made when I ripped the curly-cue off of the top, so I put an orchid in there, added green sheet moss (WHICH EVERY CRAFTER SHOULD ALWAYS HAVE ON HAND) and added a little silver pin with our initial. No. But that’s OK…. Like The Nester says, it doesn’t have to be perfect to be beautiful. It’s a little on the fragile side, so I won’t toss a bunch of apples into it, or put it where boys can get it (Or where husbands need to move it off the coffee table so they can see the TV when they’re lying down on the couch and complain about the fact that decorative items get put on the coffee table in the first place….!) But I digress. At any rate, I’m happy with my little Franken-Craft and think I’m going to create a label for this and similar posts. This puts my dollar store craft from yesterday to shame! Seriously super cute! Loves it! Well, that’s pretty much amazing!!! So freaking creative! It looks beautiful!! Holy craptastical idea! That is freaking amazing and you are SO weird! And smart! It’s a good thing, I like it!!! wow. so creative! I think it turned out great! When I see junk, I only see junk. You see junk and turn it into something beautiful. HOW DO YOU FREAKIN’ DO THAT? I’m with IA… HOW DO YOU FREAKIN DO THAT??? That looks great, I saw the mardi gras beads and thought WTH is she doing. Guess I ate my thoughts huh! I’m really amazed at what you turned that into! WOW! Hey…what do you know about painting furniture. I want to paint my entertainment center. First of all…I need to talk iKeith into it. 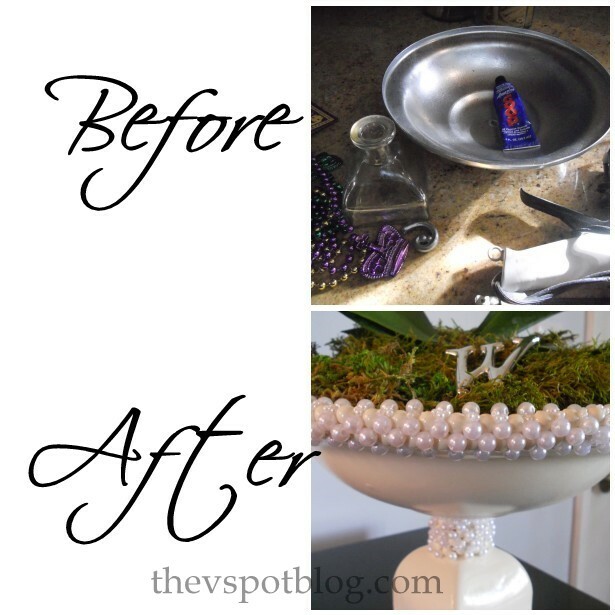 The mardi gras beads threw me at first, but once I saw the finished project I was stunned! I’m visiting from The Shabby Nest and love your trash to treasure project! Wow, who would have guessed what was under all that heirloom white! Nice job! Beautiful! Your creativity amazes me. I can copy, but I wouldn’t have been able to “see” the finished project. Thanks for showing us how you did it. I’m a new follower from Fingerprints on the Fridge. Wow, great job! I love how it turned out. I want to step inside your head for just a few minutes to just look around and steal some ideas but I’m afraid that with everything you have running around in there I’ll get hurt! That is pretty awesome! Looks like a vintage milkglass piece! Stopping by from The Weekend Wrap up! What great vission you have! I love how it turned out. WOW! That’s such a transformation!! I love it! What a great idea! I’m a new follower. I’d love for you to stop by! I absolutely love it! What a great post about turning nothing into something beautiful! Thanks for linking up! Don’t forget to join me for More The Merrier Monday and link up all of your great projects. gorgeous-what an “after!” can’t believe you put those beads on one by one, that’s dedication! looks awesome! i’d love for you to link it up at my party this Friday… i’m also hosting a giveaway! Ooooh, I love this! How creative were you? I love that you chose the orchid for it too…they go hand in hand. Doncha just love goodwill? I just went today and got a bunch of stuff for $1 each! So fun and it looks beautiful on your table! That’s incredible!! I would never be able to have that kind of vision! I’m your newest follower and would love it if you checked my blog out sometime! I LOVE the Franken-craft!!! SO great that I definitely need to create one, too!! Will have to start thinking about that one!! Also, I just found you!! Great blog!! Just beautiful…I love the pearls, nice touch! That is ah-mazing!! Love the use of the pearls!! What the what?!?!?! How did you come up with that?!!! You’re probably able to pull random nothings out of your pantry and make an amazing meal too! I so wish my brain worked like this. amazing! it doesn’t even look like what it started out as. thanks for sharing this at my party! What a great idea. So incredibly clever. Thanks so much for linking up. Wow! That turned out amazing! This rocks! I love how you used the beads! So impressed! So pretty! It looks expensive. You did an amazing job on it. Awesome! I did one of these on my blog the other day!!!! It looks great! Wow lovin your site just found it the bowl you made is just gorgeous!!! Visiting from The Thrifty Home. Really pretty. Anybody who uses Moss in a project is my friend. 🙂 hope you will swing by for a visit. I have a Monday link up party, called Meet-up Monday at Thehousecreative.com Have a fabulous day. So awesome! Thanks for linking up at Make Something Mondays! Hope to see you again next week! wow! painting it made all the difference! It’s soo pretty! This is lovely, the colour just looks perfect! Wow! Everything we see from you just gets better and better! 🙂 This is just lovely and so creative. Thanks for linking this one up to Inspiration Friday too! What a clever idea!! I have never seen anything like that. Very unique. That turned out absolutely beautiful!! LOVE IT! my kind of re-do. Truly an amazing project…I kept wondering what you were going to do with colored beads, didn’t see the spray paint coming. 🙂 Thanks so much for linking up! Such a great idea! Thanks for sharing!! Have a great week! This may be the best use of mardi gras beads I’ve ever seen! I’m totally swooning! Thanks for sharing! Amazing job, you’d never know how this beauty began life:) Thanks for the inspiration. FANTASTIC!!! What a great idea, you’re so creative and talented! Anyone has a stupid whatever that we can go ahead and follow your tutorial to the end and do this and hey, I’m your newest follower. You constantly suprise me, and in the best way possible, it makes me rethink things like beads spray painted and made to look AWESOME! LOVE it! Pearls are my fave – SO CLASSIC! I NEVER would have guessed there were so any components to it….you really thought outside the box! another LOVED project, looks so classy! Wow could you please come over to my place (Melbourne Australia) and make something out of all the crap, I mean stuff I have sitting around. It looks gorgeous! I took was a bit scared by those beads but you turned it right around. Now that’s turning a trash into a treasure…it looks awesome! This turned out wonderful! I love it. I am your newest follower! So pretty! It came out great! That is amazing I would have never thought about doing that. You are amazingly creative. That turned out to be so beautiful. this turned out great what a great idea. I am always amazed at the creativity I see here…..this is really thinking “out of the box” !! Sweetie…this is over the top gorgeous! you’ve been asked to join lots of linky’s and I hate to ask again, but if you have an extra minute pls link up this Wednesday (linky goes up Tuesday by 7:00) I’d love to feature you in the wrap-up the following week! I laughed out loud when I read your comment about husbands moving decorative items and then complain about decorative items being placed on the coffee table in the first place because they can’t see the tv when lying down…lol, glad to know I’m not alone in my decorating frustrations too! Of course, I have cluttered up his garage with projects…oops! Wow! I wasn’t expecting that tranformation from the before picture! Totally impressed! Thanks so much for linking up to Terrific Under Ten! That is amazing what you’ve done with an old piece of junk and transformed it into a beautiful item to decorate your home. It looks so clean and pure in white. Love it!